I know one thing...after several months in mothballs, College to Pro makes its season debut tonight, with four of the best rushers to ever come out of Burnt Orange nation. Yes, in this case, the sun was traded to Austin. 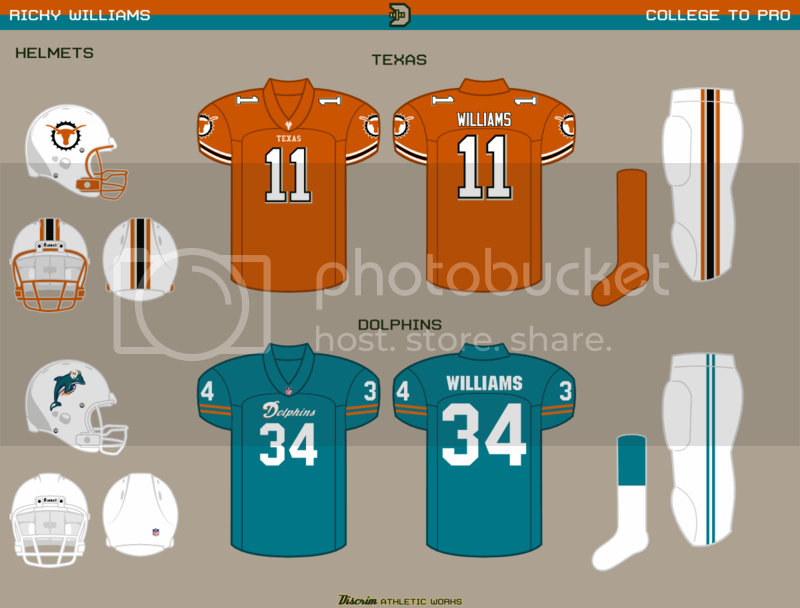 And if the striping order seems a bit off to you, you gotta remember that in this case, burnt orange replaces aqua, so black replaces orange coral. Decided to enlist the old Michigan Panthers' champagne silver color to replace navy. 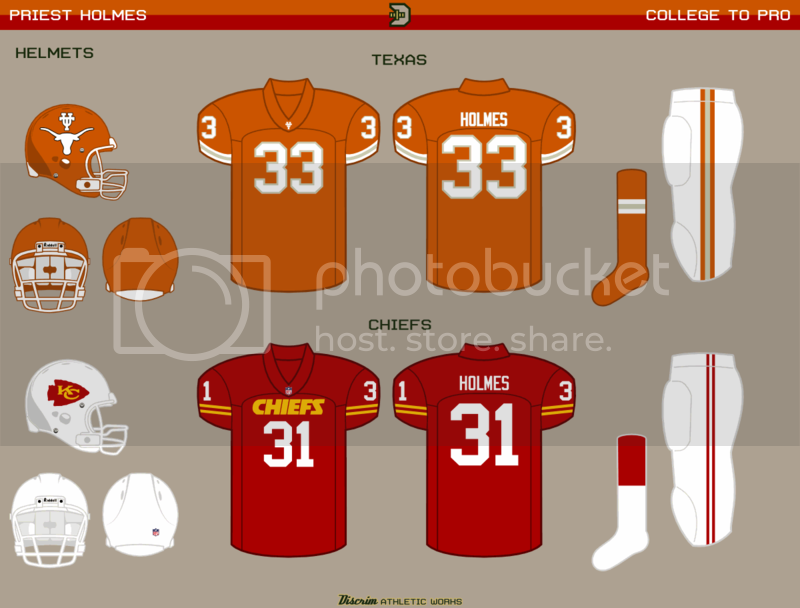 If ya need the loooord, call the Priest...Holmes, that is. Faster than a speeding bullet, more touchdown catches than a Chiefs wide receiver...it's a bird, it's a plane, it's Jamaal Charles! The arrowhead just looked a bit too awkward completely blank, so the KC remained. Likewise, I tried to add a UT to the longhorn, but that looked really awkward...so I followed Clint's suggestion and placed it above instead. 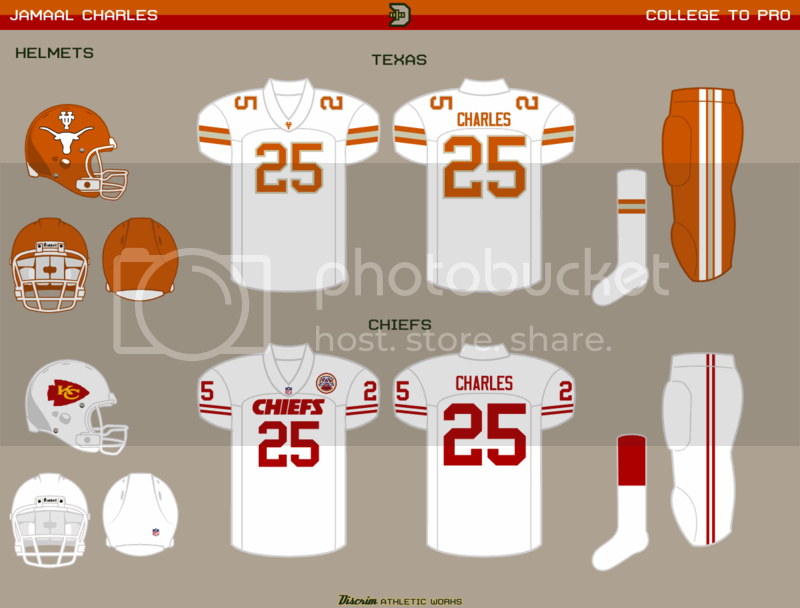 If you really wanted to include the UT on the Charles design, couldn't you have placed it above the Longhorns, like when they wore the numbers? Obviously not as large. That...would actually work. No idea why I didn't think of that myself. Marcus Mariota. Lol that will look interesting. Can you do Bruce Smith and Tyrod Taylor? *insert Richard Sherman rant* this one, I'll say probably. If/when this one comes to fruition...I will wish I'd stayed in bed. Or something to that effect. So excited C2P is back! I just had a marathon, read all the C2P threads back to back. Ricky Williams is done really well. I like the use of the sun on Texas, I think the sizing/placement is fitting. Also, you are so good at the subtle switches I barely picked up. 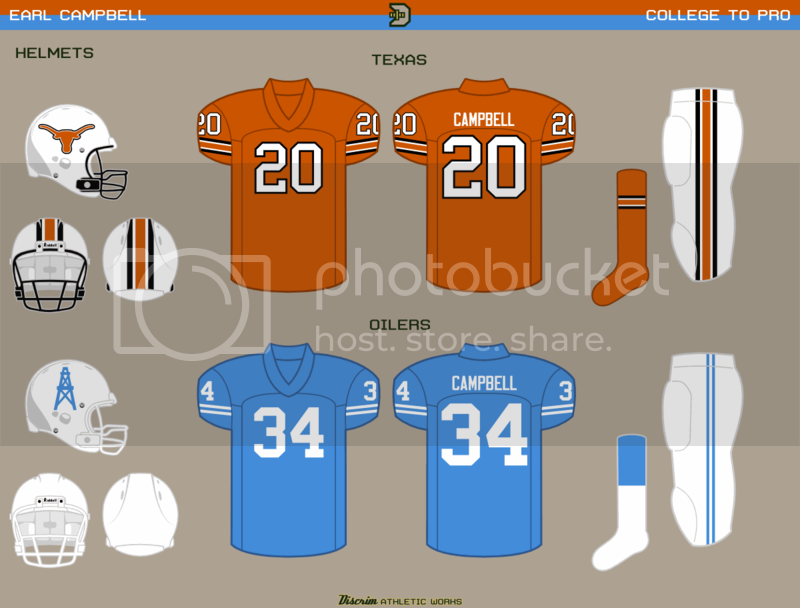 For instance on Earl Campbell, you put a black outline on Texas, and took the red one off Houston. Small change, but it changes the whole look. This whole series is so well done that it is my favorite recurring series anywhere on this site! I realize you don't put to much stock in my opinion, but nevertheless keep up the good work! I'm just thankful it's not another request As you can see from your marathon reading, I wasn't all that consistent or good with the switching early on, so thanks for noticing. As far as not taking stock in your opinion, nothing personal RockyTop...I don't all the time, and it's nothing personal, but there've been a good amount of times I have decided to take up others' suggestions...this one time back in 09, for instance, I'd posted a Spurs third with a San Antonio script I'd made, and there was kind of a spontaneous Fan Nation style throwdown between one guy who liked the script but thought I could improve on it, and another guy who liked the raw, imperfect nature of it (in the end, I made what I felt were the necessary tweaks). Also, as you probably saw in your marathon reading, the very first, all-Miami set is, and will remain, the lone C2P set in which I didn't touch the helmets. Taking others' opinions into account, even if I don't redo whatever concept is being commented on, has only helped me improve over the years. My own judgment, though, led me to return to themes for this series, largely because I feel they're more fun than an overall superthread the got bogged down in requests. So, a group of bad QBs? That Class of 83 I never got around to? 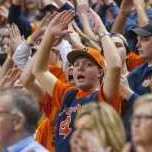 Players whose draft rounds no longer exist? Coaches who'd made it as players? Steve DeBerg? I wanna do all of that. I may just take you up on that...I can see it now: C2P Special Edition: Other Fields of Study...okay, so the title will need work. But I can see it in my mind.